The West Ham sewer system was a combined foul and storm water facility overwhelmed by rainfall on a number of occasions over the last decade, putting approximately 500 homes at risk of flood damage. 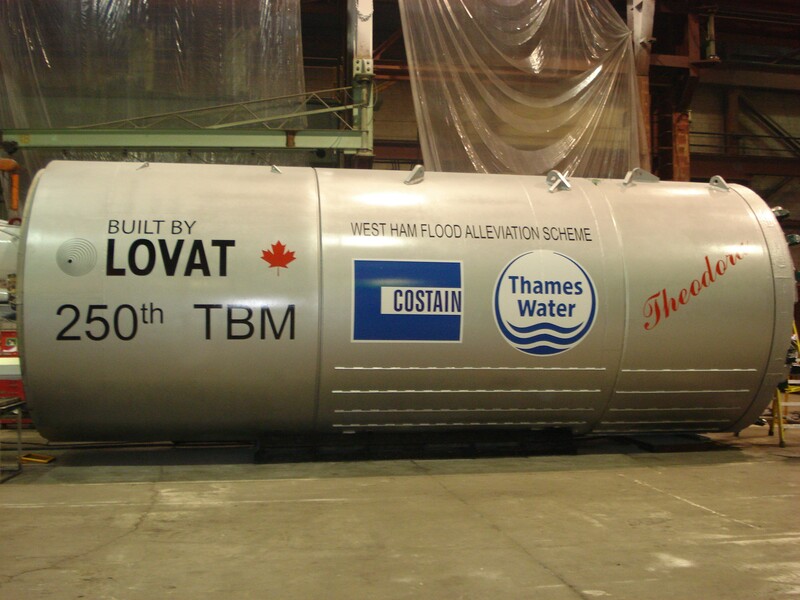 In 2008 Costain Ltd were awarded the £39 million contract for the design and build of the West Ham Flood Alleviation Scheme (WHFAS) Project for Client Thames Water. The project involved works between the Abbey Mills pumping station and Forest Gate tube station, some 3.3km to the north-east, directing storm water flows under gravity into the main storm water tunnel located beneath Upton Lane and other roads, to flow directly to Abbey Mills pumping station. 3km of 2.87m diameter tunnel through mixed ground (London Clay and Lambeth Beds) using a new full face EPB TBM. 5 No. main tunnel shafts, including a major pumping station (12.5m diameter). These were sunk using a combination of caisson and underpinning, most involving specialist ground dewatering. A number of 1.2m diameter microtunnels, totalling 2.5km in length, using slurry TBMs. 19 microtunnel shafts of varying diameter between 1.5 and 6m. 2km of “live” online pipeline upsizing and a large number of new manholes all completed within the busy streets of West Ham. Service diversions and traffic management arrangements to enable the works. LBA personnel worked fully integrated within Costain’s site production management and engineering teams. The project required a high level of third-party coordination, with the main parties including City of London (CoL), London Borough of Newham (LBN), London Underground Lines (LUL), Docklands Light Rail (DLR), National Rail, Transport for London (TfL) and Channel Tunnel Rail Link (CTRL). The regular liaison with the third parties ensured communication lines remained open and each party was fully informed of issues affecting them. A major constraint was to avoid adding to the congestion on the streets of West Ham where most of the construction took place, completing the construction as considerately as possible. In practicable terms this meant completing as much of the replacement sewer works by “no dig” technology as possible and programming the works so as to minimise restrictions on access to streets. The project also had to be undertaken whilst ensuring little or no disruption to the normal operation of the clean and foul water services to the local residents. The site of the terminal pumping station and launch shaft for the main tunnel TBM at Abbey Mills (Shaft T1) was contaminated from its varied uses over the years. This site was already in use when the Victorians built the original Abbey Mills pumping station. Through considerable site investigation (including historical and current geotechnical boreholes), the spread of the contamination has been documented. 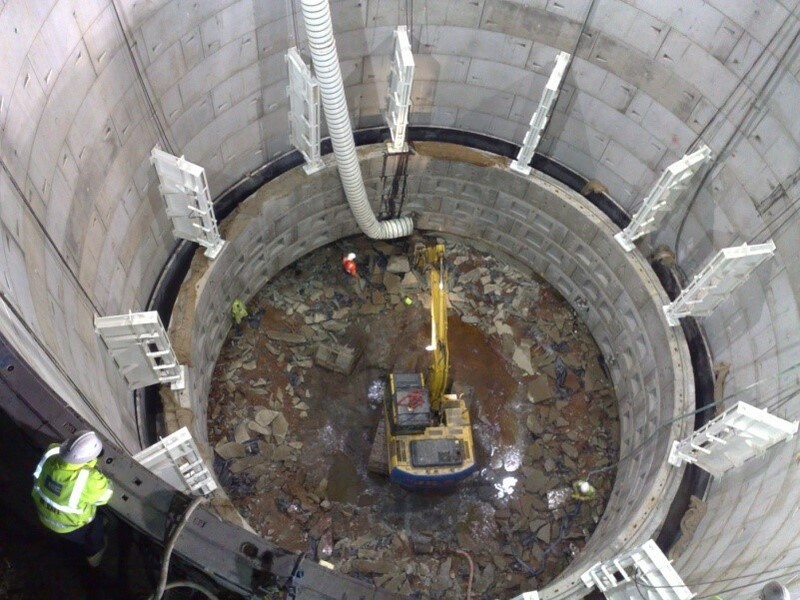 Thus the main shaft had to be sunk through contaminated upper strata, whilst keeping the clean lower levels intact, and keeping the working environment safe for the workforce. The solution adopted involved constructing a secant pile wall cofferdam prior to sinking the shaft within this.